TURNING around a debt-laden company is never easy. But Tan Sri Azman Yahya decided to take the bull by the horns after he joined Symphony Life Bhd as executive chairman in 2006. Thanks to him, the property developer previously known as Bolton Bhd is now focusing on niche projects. “We have some bread-and-butter properties — inherited from the old Bolton — which we will continue, such as Amanjaya in Kedah and Taman Tasik Prima in Puchong, Selangor. But the group’s goal is to go niche,” he tells City & Country. Prior to Azman coming on board, the company mostly offered mass-market products that were between the mid and mid-upper price band. After a quiet period, Symphony Life has now launched four projects and seen good take-up rates. “It is not that we did not have the products. It was having to try to get the approvals, the right design, the right concept … and the market [situation] changes our concept as well,” he says, explaining the lull. When Azman joined the property developer, it was over-diversified and knee-deep in debt. Using his experience as the head of Pengurusan Danaharta Nasional Bhd — the national asset management company — as well as chairman of the Corporate Debt Restructuring Committee during the 1997 /98 Asian financial crisis, he did what was necessary to change Bolton’s course. This included selling off its non-core assets, ensuring all debts were settled and changing its focus back to property development. Today, Symphony Life, which celebrated its 50th anniversary last year, is seeing the benefits of the restructuring. Even with the tough market condition last year, its sales performance was encouraging. “Despite the tough market last year, we saw impressive sales of over RM700 million,” Azman points out. “Our previous record was RM660 million three years ago. And our unbilled sales are now just touching RM700 million. Azman reveals that Symphony Life will be developing niche high-end products, which is evident from some of its recent launches — TWY in Mont’Kiara and Star Development in Jalan Yap Kwan Seng, Kuala Lumpur. Launched in December last year, TWY is already 80% sold. According to Azman, the project — the first under his leadership — epitomises his vision of the Symphony Life brand. He shares how the idea of a 700 sq ft duplex first sounded ridiculous to him until he stayed in a hotel in Naples, Italy, where the room was a duplex. TWY, which rhymes with “try”, means “two” in the Norman language, commonly spoken in Normandy, France. And, as the name suggests, there are two towers being constructed on a two-acre freehold parcel. The RM428 million project will have a 50-storey North Tower and 48-storey South Tower. They will be joined by a central lift core; from above, the structures will be in the shape of an X. There will be 484 duplexes in total, and all of them will have double-volume windows. The built-up of the 1-bedroom, 2-bedroom and 3-bedroom units will range from 662 to 1,385 sq ft and the price from RM730,000 to RM1.36 million, or an average of RM1,000 psf. The maintenance fee will be 40 sen psf, including the sinking fund. Besides the high windows, another unique feature of TWY will be the first wetland ecosystem within a high-rise residential development. Located on the water podium on Level 7, the self-cleaning pond will contain plants that will oxygenate the water features. 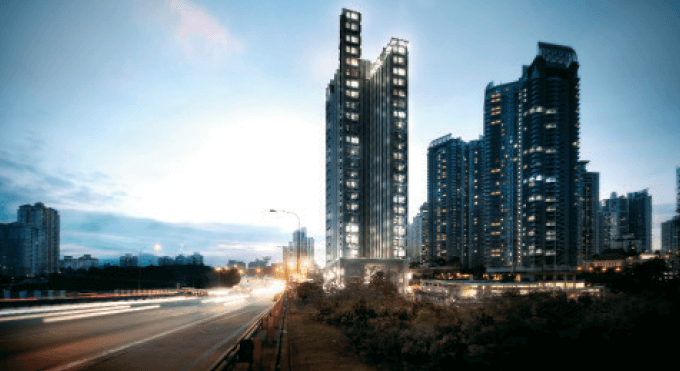 With the successful sales seen in TWY, Symphony Life will be launching a second project in Mont’Kiara opposite the TWY site by year-end, Azman reveals. To recap, the group acquired a four-acre parcel in Mont’Kiara in 2012 and has developed only two acres, where TWY is sited. The remaining two acres, separated from TWY by Jalan Segambut, has no official name at the moment but the working name is TWY 2. “The special thing about TWY 2 is that it can be accessed from Mont’Kiara. There will also be a flyover from Jalan Segambut to TWY 2,” says Azman, adding that the cost of the flyover will be borne by Symphony Life. However, he declines to provide the exact figure. The project is still in the planning stage but Azman says it will offer about 400 units and they will not be duplexes. The estimated gross development value (GDV) of the project is RM400 million. According to Kiara Realty principal Lee Meng Tuck, TWY meets the demand for small units in Mont’Kiara. Moreover, as the units will be fully furnished, buyers — mainly the young — will not need to spend more when moving in. Lee sees the project as being ideal for empty nesters and single individuals who may not need a large space. He says property prices in Mont’Kiara will hold up well in the future. “In the secondary market especially, prices will be supported in both the resale and rental market. This is due to the fact that there will be no new supply in 2015/16, except for The Signature.” The developer of The Signature in Desa Sri Hartamas is MBM Land Sdn Bhd. The other high-end niche development by Symphony Life is Star Residences, whose first launch was held in October last year. The three-tower Star Residences is the residential component of a mixed-use project called Star Development, which will also feature a five-block, six-level retail section. Sited on four acres, the project is a joint venture between Symphony Life and United Malayan Land Bhd. Heading the JV company, Alpine Return Sdn Bhd, is chief operating officer Alan Koh, who was present at the interview with Azman. “We have owned the Star Residences land for many years. It has gone through many permutations in terms of what to build there,” Azman explains. “When Alan came on board, he decided to go purely residential. The big difference is that he took the view that we have to go high-end … even the commercial portion in front of the development, which will have retail outlets, and a Michelin-starred restaurant. This tower is set for release in October this year, while the third and last tower will be unveiled some time in 2017. The first tower, called RT1 (short for Residential Tower 1), will be 57 storeys high and feature 557 units priced at RM1,600 psf. The built-ups will range from 625 to 722 sq ft. The second tower, RT2, will have 58 storeys and 482 units, with 47 of them being dual-key dwellings. Built-ups will range from 707 to 2,989 sq ft, and the estimated selling price is RM2,100 psf. Koh says the inspiration for Star Residences is W Hotels, and the property developer has tweaked the interior design accordingly. Koh says the company has not selected the Michelin-starred restaurant that will be operating in Star Residences, but “we are doing a very detailed positioning of who should come in” to the commercial component of the project. Besides TWY and Star Residences, Symphony Life also launched two other projects recently, one in Puchong and the other in Kota Bharu in Kelantan. “These are smaller compared with [TWY and Star Residences]. One is called Elevia Residences and is part of our Taman Tasik Prima development, and the other is called Tijani Raja Dewa in Kota Bharu — the first high-end development there,” Azman enthuses. 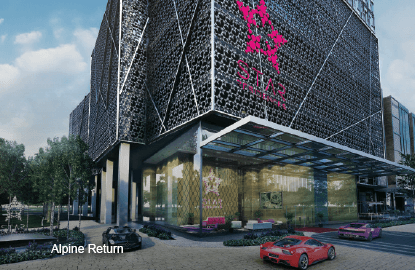 Elevia Residences, launched in August last year, has already seen 70% take-up. It has a GDV of RM126 million and sits on about 2.85 acres. The project will have two components, a 128-unit, 26-storey condominium and thirty-four 3½-storey villas. The condos will have built-ups of 859 to 2,337 sq ft and are priced between RM566,040 and RM1.16 million. There will only be six units per floor, with all of them offering views of the lake. Facilities include a Sky Deck, Sky Gym and Sky lounge as well as the usual swimming pools and family-friendly facilities such as playground and nursery. The villas will have built-ups of 2,620 to 3,034 sq ft and are priced at RM1.32 million to RM1.6 million. They will be built on a 3-storey car park, elevating them to about 30ft above street level, and they will face a linear park. Meanwhile, Symphony Life’s Tijani Raja Dewa project was launched in April this year and has achieved 30% take-up. The project sits on 7.4 acres and will offer 16 three-storey semi-detached houses, 41 three-storey superlink terraces and 150 units in a 16-storey apartment block. With a GDV of RM181 million, Azman reckons that “we are setting the standard in the market in terms of design and price”. He highlights that “the most interesting product is the semidees, priced at nearly RM2 million, and we sold 13 out of 16”. The semidees will have a built-up of 3,420 sq ft and the actual selling price is RM1.92 million to RM1.95 million. The 3,141 sq ft superlink terraces are priced from RM1.18 million to RM1.52 million, while the apartments, with built-ups of 933 to 1,424 sq ft, are priced at RM549,430 to RM759,050. To further expand the Symphony Life brand, the group is looking to build its own corporate head office in Jalan Semangat, Petaling Jaya, Selangor. “We want a building that is designed to reflect the new Symphony Life identity and, at the same time, house our sales gallery with enough space to accommodate a two-level show unit,” says Azman. Called Symphony Square, the 20-storey office block will comprise a three-level retail podium and 17 levels of offices. To be managed by Symphony Life’s in-house property management team, the building will have a Green Building Index certification and MSC status. Azman reveals that the group is scheduled to move in in the third quarter of 2018. While the office is a one-off project for recurring income, Azman shares that the group is on the lookout for more land, especially in Greater Kuala Lumpur. However, it is not in a hurry to buy tracts as its plate is full as it is. 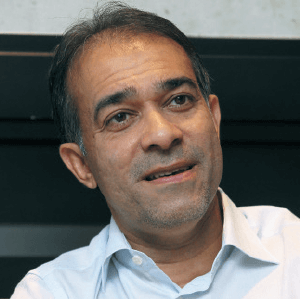 One area on Azman’s radar screen is Shah Alam in Selangor, which he thinks is “under developed” as developments are moving south towards the Kuala Lumpur International Airport. “We have surplus funding that we have not used. We can easily spend about RM200 million on land acquisition, which is about 20% of the shareholders’ funds, because we can get 70% funding,” he says. This article first appeared in City & Country, The Edge Malaysia Weekly, on July 6 - 12, 2015.